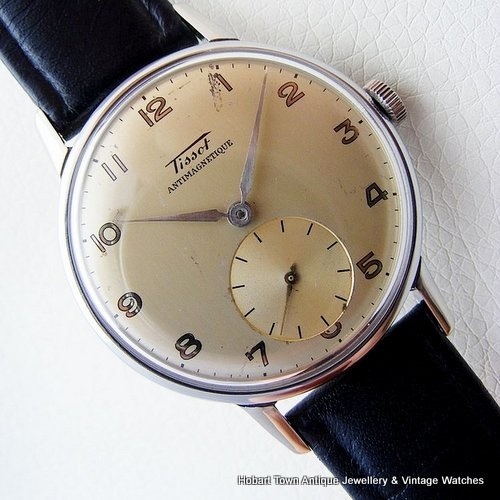 This vintage Tissot military style handsome 35m huge seconds dial watch is a particularly attractive watch and is in fine original condition. 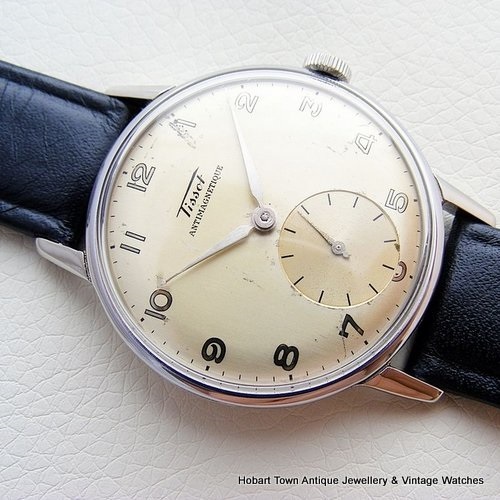 This Vintage Tissot Military Style Handsome 35m Huge Seconds Dial Watch is one stylish piece! 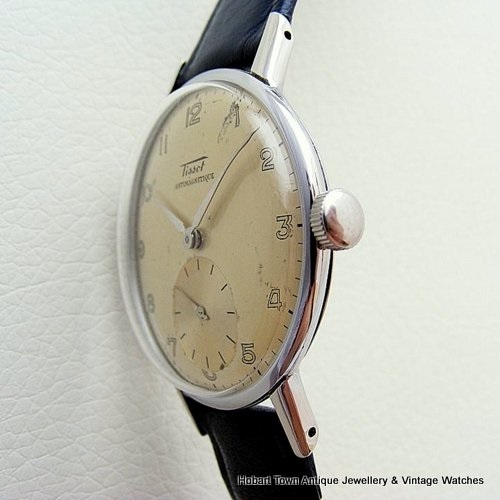 I have snuck this handsome Tissot into the Omega section as well , due to being a full brother to Omega & sharing the same parents and at times , same house! 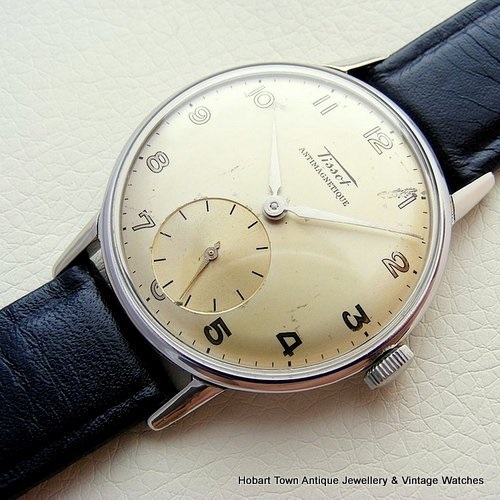 Made when Omega was the owner & originator of the Tissot Watch Company , 1945. 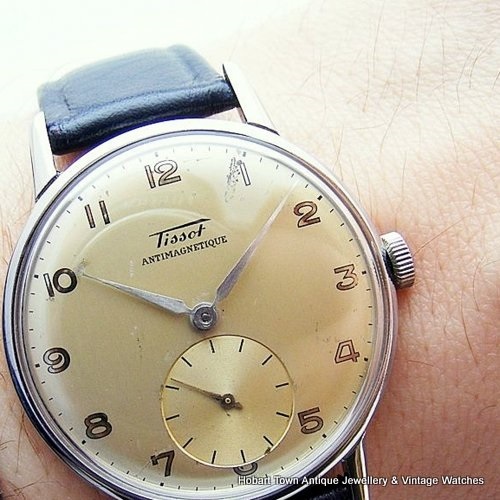 Minimal difference between some models & even with some of Tissot’s 1940’s chronographs now selling for larger prices than some Omega chrono’s ~ which is a pretty good indicator as to where quality , early examples of Tissot watches sit on the price ladder of 1940’s watches. Being a full 35 mm’s w.o.c. 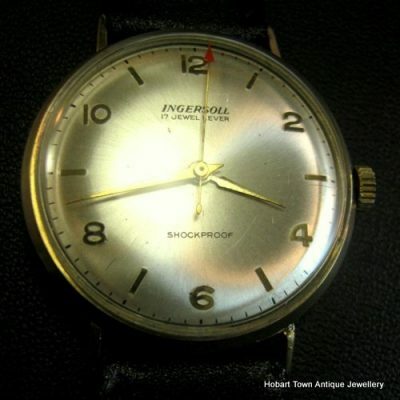 and with such a narrow bezel , no change in the minute chapter ring and with the same colour running from center to edge ~ these 3 factors result in this cool Vintage Tissot Military Style Handsome 35m Huge Seconds Dial Watch appearing much more like a 37 mm watch on a wrist! 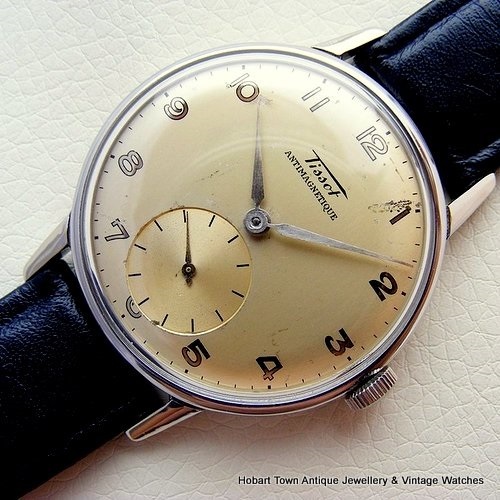 Dating to 1945 , the military style is clearly evident with the dial yet it is not a military watch per say , not made for the armed services but more in the general aesthetics of some military watch dial designs. 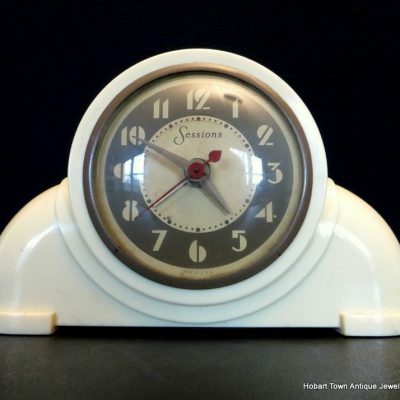 Original dial has developed an ivory like appearance & is better than the photo’s suggest ~ it really does look the goods when viewed in person! We will attempt to take some more accurate images shortly. 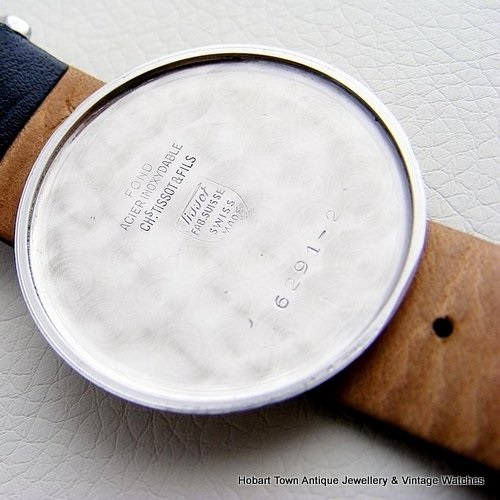 Some ‘ham fisted’ attempts to open the case back has left some edge marks when case backed opened & has zero baring on the watch and are exaggerated by the high resolution images. 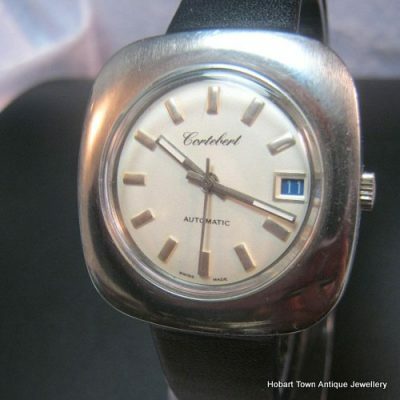 This is one attractive vintage watch , with quality to back up the looks ~ it has just been serviced & is running just as you would expect it to! 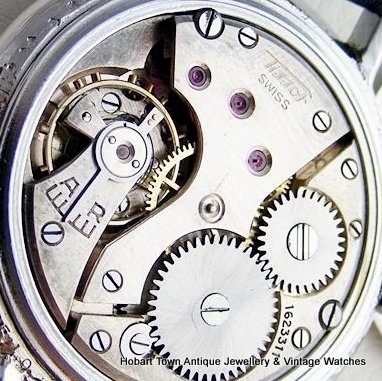 Coming to you with our complimentary warranty ~ for your peace of mind. 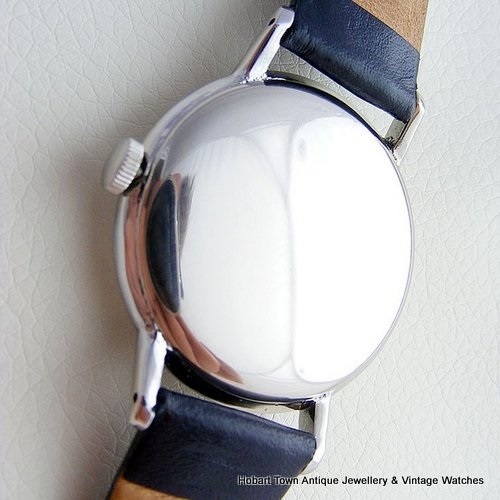 We sell fine & often genuinely rare items , we sell them at ‘competitive prices’ & we guarantee all listings & all statements made on each piece! 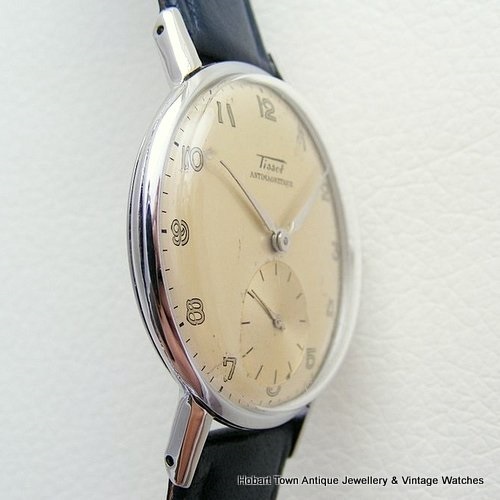 This 1945 Vintage Tissot Military Style Handsome 35m Huge Seconds Dial Watch is with dark blue leather strap fitted and suits the watch well. 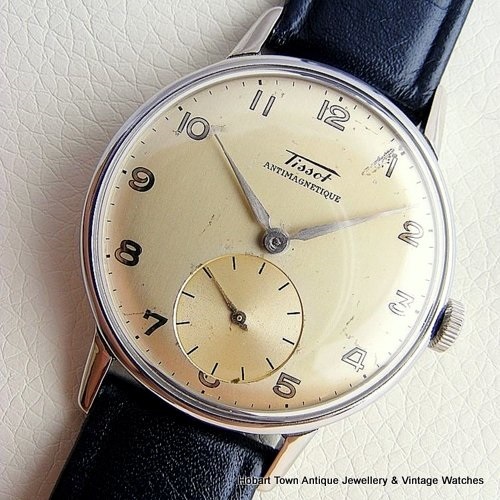 Please email with any questions about this handsome vintage Tissot and we will reply ASAP.